VLAN(Virtual Local Area Network) is an emerging data exchange technology, which divides the LAN equipment into small network segments logically to complete a virtual work group. There is one simple change that is need to be done in CCBoot server. 1. Open CCBoot installation directory. 2. Look for db.xml file and open it with notepad or notepad++. 3. There you need to change a value for dhcp_send_route_always to 1. 4. Once changed save the file and restart the ccboot service. 5. If you are using other DHCP service, please refer toCCBoot Works with 3rd Party DHCP. If you are using CCBoot DHCP only then there is no need to do this step. 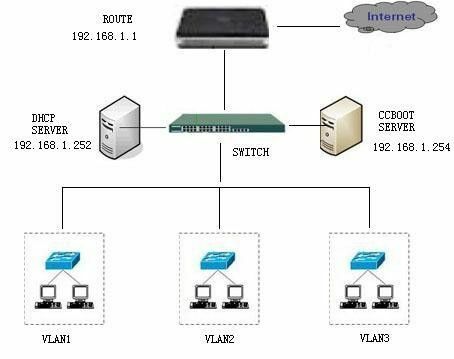 1) If CCBoot server and clients are in the same VLAN, just configure as the above steps is OK.
2) If the server and clients are in different VLANs, e.g, the server is in VLAN1, and clients are in VLAN2, you need to find the interface of VLAN2 in the switch, and then configure ip helper-address command for this interface. The command should be like this (suppose CCBoot DHCP server IP is 192.168.0.1), "ip helper-address 192.168.0.1", so the DHCP broadcast requests from VLAN2 could be forwarded to CCBoot server on VLAN1, and then the DHCP reply from CCBoot server will be forwarded to VLAN2. > ip helper-address 192.168.0.1 is applicable to cisco switches. However, If you have a switch from other vendor (example H3C) please use the commands below. Note: In above 192.168.0.2 is MSDHCP in the same vlan as CCBoot server and if they are in different VLAN then change corresponding IP address in step 6 through 9. Once above commands have been executed, you can now boot clients from the CCBoot server. For more information about ip helper-address, please refer to http://en.wikipedia.org/wiki/UDP_Helper_Address.